Little Italy (film, 2018). A 2018 romantic comedy film with "R" rating by Entertainment One (Canada)/Lionsgate (United States). Directed by Donald Petrie. Official Trailer. Little Italy is a 2018 romantic comedy film directed by Donald Petrie. 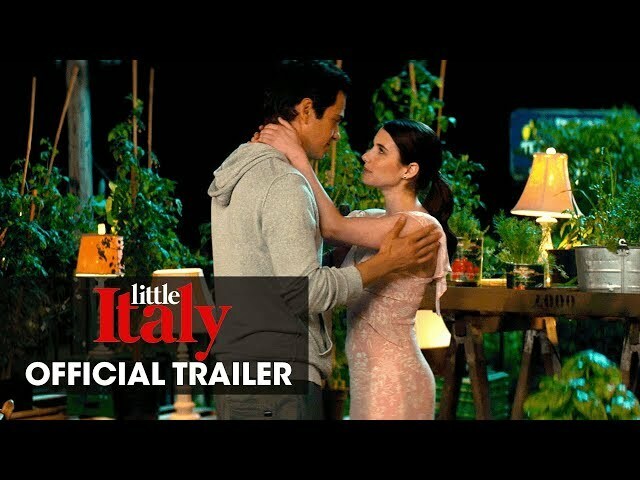 Little Italy (2018) Trailer - Available In Theaters and On Demand September 21. Nikki and Leo both grow up in "Little Italy" in Toronto, where their families are running a pizza business together. However, the verbal conflict between Sal and Vince (father of Nikki and Leo respectively) caused their pizza business to deteriorate, thus they founded their own pizza businesses next to each other's doors, resulting in Nikki leaving the family to go to London to study cooking. However, Chef Corinne temporarily gives Nikki a break for two weeks to give time for her to work on a cooking menu for the upcoming cooking exhibit. Upon arriving home in Toronto, Nikki meets Leo at the bar and they drunkenly play soccer in a midst of the thunderstorm. The next day, she is welcomed by her family on her arrival. Vince, Leo and other crew are later arrested for lacing the pizza with marijuana to the customers during the party but they are released shortly after. Leo later forms a relationship with Nikki for few days and sleep together after riding around the town, reliving their childhood memories. Nikki receives a call from Corinne, saying that she wants a cooking menu, otherwise she will promote another one. Struggling, Nikki expresses her regrets to Leo and confronts him for focusing on soccer instead of the pizza business. Meanwhile, their respective grandparents, Franca and Carlo, become engaged. Franca finally agrees to marry Carlo despite a promise from her late husband not to remarry. Franca and Carlo arrange for their families to go on a dinner. During their family dinner at the restaurant, Franca and Carlo announce their engagement, causing Sal and Vince to begin exchanging insults. Vince decides to enter the pizza competition with Sal saying that whoever loses will "go out" from the "Little Italy". When the two realize that they are banned from the competition due their fallout from the previous competition, they decide to have Nikki and Leo enter the competition. Nikki refuses to compete, and she and Leo start arguing about who let who win in soccer when they were kids. When Nikki says that Leo won every time because she let him win, Leo says, "Yeah, like you let me win last night," alluding to them sleeping together. She slaps him and storms out in anger. Principal photography began in June 2017. The film Little Italy was scheduled to be released by Entertainment One (Canada) and Lionsgate (United States) on August 24, 2018 (Canada) and on September 21, 2018 (United States). The duration of the film is 102 minutes. Little Italy got low rating from critics. But the audience likes the film.